Advent calendars are an aid devised by adults for children to illustrate the time left until Christmas Eve and to work up their anticipation. They are sure to date back to a much earlier date than archival evidence shows. One early evidence of a kind of Advent calendar comes from a children’s book by Elise Averdieck dated 1851: “In the evening when little Elisabeth goes to bed, her mother always tells her a little bit about the Christmas story and they learn and sing lots of Christmas carols. Every evening a new picture is added to the wallpaper and the children know that when all twenty four pictures are hanging on the wallpaper then Christmas is here.” Chalk marks on doors where one is wiped away every day or straws placed in the nativity crib every day were also used for children to count the days. The first Advent calendars were still called “Nicholas calendars” as they were given out on the December 6, St. Nicholas’ Day. Soon, however, the calendars started on December 1 and were called a “Christmas calendar” and then finally the name “Advent calendar” established itself, especially as some calendars appeared with the annually variable number of Advent days. The oldest printed Advent calendar is also not a calendar in the classic sense but a clock. It is supposedly the “Christmas clock for children” from 1902 with rotating brass hand whose dial begins with 13 and whose panels mainly contain Christmas carol verses. 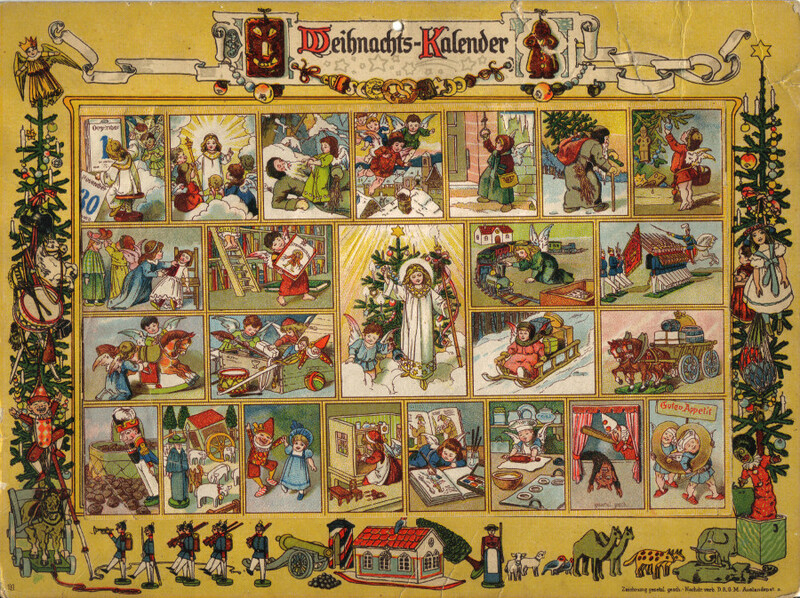 However, Gerhard Lang (1881-1974) is considered to be the “inventor” of the printed Advent calendar. As a child he had received 24 cookies sewn onto the lid of a box by his mother and he was allowed to eat one of them every day during the Advent period. Remembering this, he produced the first printed and commercial Advent calendar in 1908 following a pilot project in 1904 and him joining “Reichhold & Lang, lithographische Kunstanstalt G.m.b.H., Munich” (=RLM). 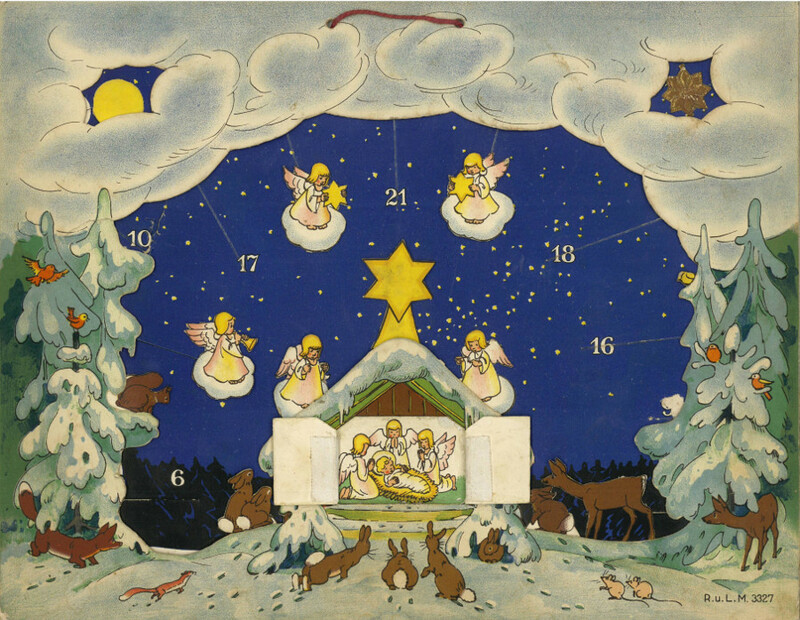 With this Christmas calendar (motif: “In the land of the Christ Child”), which was drawn by Ernst Kepler, a famous illustrator of the time, he sparked the continuous spreading of the Advent calendar. The first Advent calendars were published in numbered editions. Although sales were rather slow to start with and the first World War initially stopped the popularisation of the Advent calendar, increasing demand started from 1920 resulting in the variety of motifs being expanded. From now on Advent calendars were also launched on the market in several designs varying in size, price and stability. For example, around 1927 “In the Land of the Christ Child” came out as a tear-off block with accompanying “picture album” where you could stick the calendar page pictures in. Around 1926 Lang brought out an edition of the Advent calendar “The Christmas Rose”, which was the first Advent calendar with 20 pieces of chocolate from the Stollwerck company. “In the Land of the Christ Child” also appears for blind children around 1930. By the end of the 1930s Advent calendars were being sold by several publishers. 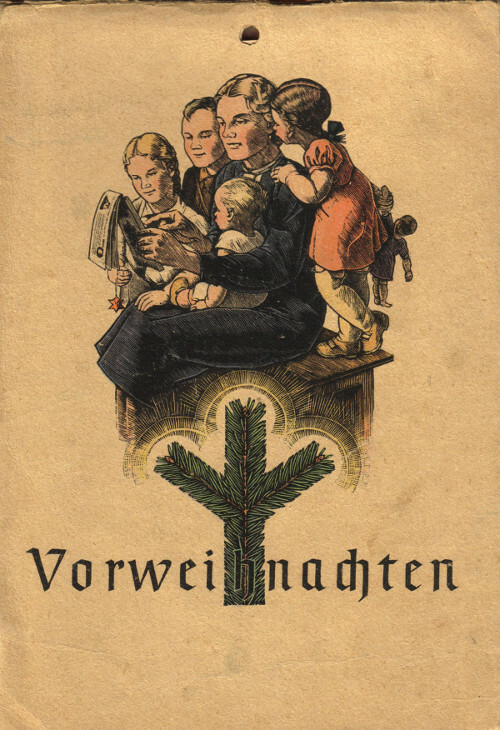 Among others also by Franz Eher Verlag, which was the only publishing house exempt from the ban on printing illustrated calendars as a result of its party political importance in the 1940s and was therefore also allowed to produce Advent calendars during the war. However, during the NS regime the name is changed from “Advent calendar” to “Pre-Christmas calendar” and the traditional pictures and religious content are replaced by “new” symbolism and ideological content. The production of Advent calendars recovered quickly immediately after the Second World War and even triumphantly advanced overseas. Printed Advent calendars were and are still always an expression of contemporary art in their artistic design, regardless of whether they’re Advent calendars for standing up, hanging up, cutting out, tearing off or sticking on, whether you can open windows or tear off cover sheets, whether they’re one dimensional or three dimensional, whether you can stick figures on them or just look at the pictures and texts.